Big Finish: Doctor Who - DOOM COALITION 1 Review | Warped Factor - Words in the Key of Geek. We're all dooooooomed - as usual, says Tony Fyler. Back in the day, Paul McGann's Eighth Doctor was one of the mainstays of Big Finish's output. In fact it was one of the company's proudest boasts that it had given the Eighth Doctor the seasons of Who he had deserved but never had the chance to play out on screen. The thing about Dark Eyes, if we're honest about it, is that it stopped making sense as a series pretty early on. Certainly by the time Dark Eyes 2 arrived, the business of Molly's retrogenitor particles was getting convoluted beyond the point where many could follow it. The box sets still delivered good stories over the course of single episodes or two-parters, but the series arc grew increasingly flabby as time went on, throwing monsters, companions and villains in to keep the momentum going - Daleks, the Eminence, the Alex Macqueen Master (proving a brilliant foil for McGann's Doctor), the return of Nicola Walker’s Med-Tech Liv Chenka, and even going so far as to put a Sontaran on the packaging, though they appear for barely a handful of heartbeats. The Doom Coalition is the new series arc that's taken over now that Dark Eyes has finally finished. And on the evidence of the first box set, things have gone if anything a little downhill as far as story arcs are concerned. The Big Bad here is a fascinating concept: the Eleven - a Time Lord who, rather than progressing from one incarnation to the next, has been stuck in a body where all his previous selves are able to assert control at any moment. The idea should be more interesting than it's given room to be here though. The temptation to write and play the multiple personality crisis of the Eleven as less like Sybil and more like Dr Strangelove must be strong, but it doesn't really work on audio - at least not as often as it's used across the two stories in which he really appears in this four-story box set. You're left listening to the Eleven telling all his former selves to shut up and stop interrupting, and it's hard to do less than fully agree with him. But still, as if to prove and re-prove the concept of the Eleven, the other selves are incapable of stopping themselves from butting in. Rather than make the Eleven seem dangerously unstable though, these intrusions make him sound rather cartoonish, or even buffoonish, a comedy bad-guy it's difficult to take seriously, to the detriment of the drama. That said, at least three of the four stories here are good Eighth Doctor stories. The Eleven, the opening story by Matt Fitton, effectively sets up the threat (including a prelude with the Eleven and Sylvester McCoy's Seventh Doctor - which honestly works rather better as a pairing than the Eleven and the Eighth does). The Eleven is Gallifrey’s most dangerous criminal, and to give him his due, in Fitton’s script, the annoying jibber-jabber of conversation between the Eleven’s incarnations serves the purpose of showing us how his regenerative dissonance could work to make him so dangerous. Also, it’s a bit of a treat for fans of the Time Lord’s home planet, as the references are shoved in thick and fast – President Flavia, President Romana’s pro-alien reforms, transduction barriers, Shada, the Castellan, the President’s apartments with their musical key, the Omega Vaults, they’re all in here. There’s also – as there is throughout this box set – a good sense of the relationship between the Eighth Doctor and Liv having developed. In moments of crisis, the old Liv Chenka roars to the fore, but in between, she’s happy enough to banter along with the best of them, becoming by no means an omni-companion, but delivering all the stuff a modern companion needs to do, including the verbal clip round the ear the Doctor sometimes heartily needs. None of which entirely distracts from the fact that the plot’s a bit ragged, borrowing a good chunk from Silence of the Lambs and culminating in an escape that’s rather more desperate than you’d expect of Gallifrey’s Most Dangerous (has anyone told the Master about this table by the way, because on the basis of the Eleven’s performance here, he’d probably be up for a good seethe). The Red Lady by John Dorney is a story hangs in this box set by the most insubstantial and tangential of threads. The Doctor and Liv come to London in 1963, chasing an anomaly that’s the responsibility of the Eleven. Along the way they meet art historian Helen Sinclair, a blistering, fumingly good performance from Hattie Morahan. Helen’s the kind of person guaranteed to pique the Doctor’s interest, half scholar, half fighter, and the three are soon on the trail of a deadly entity with a simple but effectively creepy modus operandi. There’s solid pacing to the inevitability of the threat here, that brings to mind The Mummy On The Orient Express (if that’s not a recommendation to you, you need to go back and re-watch that one). Long before the end of it though, you’ve entirely forgotten the Eleven or that he’s supposed to be involved in the story somehow. He pops up attached to that tangential thread at the end, and leads us into the third story, The Galileo Trap by Marc Platt. I’m biased on this one – I have a fanboy love of Galileo, and while there’s exceptional texture to Platt’s story, and if you’re going to have anyone voice the man, you honestly couldn’t do better than John Woodvine, overall it feels as though The Galileo Trap is rather more about the incidental monsters, Fortuna and Cleaver, than it is about the mathematician who could be a source of several great Doctor Who stories. 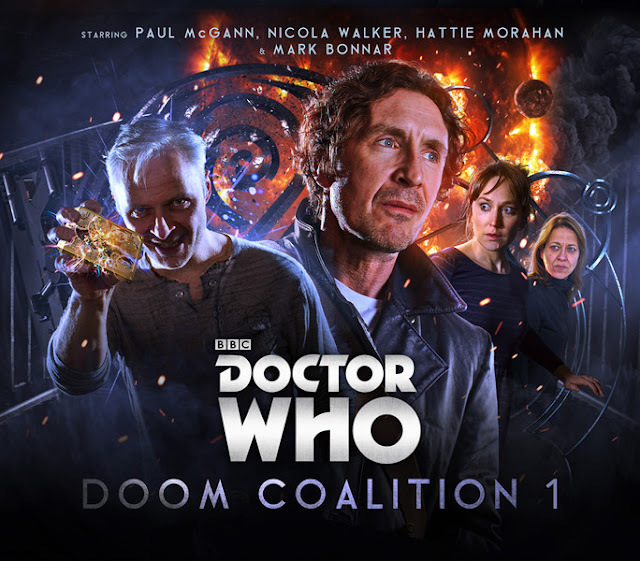 There’s a Vampires In Venice vibe to the whole thing that while making some sense, just feels a little deflated if you’re going to go to the trouble of putting the Eighth Doctor and Galileo in a room together. As with The Red Lady, the Eleven pops up at the end of this story too, mostly, it feels, to remind us he’s still there and that theoretically the story arc’s supposed to be about him. The Satanic Mill by Edward Collier takes the concept of ‘an odd one,’ renders it down in the intense heat of a stolen stellar manipulator and then pours a thick, gloopy ‘odd one’ just all over your brain. Most of the oddness comes from the fundamental smallness and focus of the Eleven’s plans. It feels like he’s stolen the kind of technology with which you could deliver a Day of the Doctor to deliver something about as cosmologically troublesome as the Master in Castrovalva. Nevertheless, there’s some very ‘visual’ writing here, and the sense of being trapped in a kind of industrialised Escher painting of George Orwell’s 1984 is well rendered. But if the oddness and the smallness underpin a sense of disappointment in this final instalment, the actual ending adds a soupcon of bafflement that runs a big risk of making the last four hours of your life seem fairly wasted. So is The Doom Coalition 1 a dead loss then? Absolutely not – as with the later Dark Eyes box sets, there are good stories here: for my money, The Red Lady stands head and shoulders above the rest, with The Eleven second. And there are fantastic performances from some great actors – Robert Bathurst is here as an old school friend of the Doctor’s, Caroline Langrishe as the latest in a long line of Time Ladies to get properly snippy with the Doctor. Ramon Tikaram’s here, though to be fair, blink and you might miss him (great visual though – Ramon Tikaram as the Castellan of Gallifrey, oh worlds of hellyes! ), Matthew Cottle, decades ago of Game On, here adds another in a long line of well-meaning weeds to his CV as Pain, and oh did we mention, the human-shaped clump of star matter that is John Woodvine plays Galileo! For the most part, it’s not the stories themselves or the performances that let down The Doom Coalition 1. It’s the fact that it feels like a pretence at a series arc, with only the first and last stories featuring the series villain. Let’s hope that when the Eleven returns in The Doom Coalition 2, there’s more doom, at least a whiff of a coalition, and more of a sense that his reputation as Gallifrey’s most dangerous criminal is actually deserved. Those are bases that have yet to be touched, and they really need to be to make The Doom Coalition work.